– I love when poetry incorporates science to broaden the scope of its lyric content—simply put, I love Meredith Trede’s Field Theory. The most striking component of Meredith Trede’s collection Field Theory, is the book’s construction. The title, sections, epigraphs, and poem order all speak the multifaceted study of field theory. Field Theory plays a part in mathematics and Newtonian gravitation. 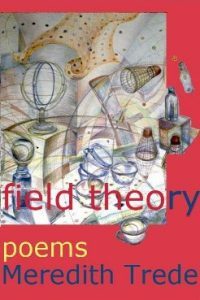 Maybe more importantly for this collection of poetry, Field Theory is also a psychological theory which examines patterns of interaction between the individual and the total field, or environment. The collection as a whole works with the precision of a poem—building layers of approachable literary density. Part I of the collection begins with a epigraph by Stephen Hawking which reads, “Field: something that exists throughout space and time as opposed to a particle that exits at only one point at a time. The section precedes with poems that mark specific moments of tragedy; these tragedies are read as particles existing at a defined point in time. The poems subjects cover a large spectrum; from the parts of speech to genocide, Part I includes snapshots of tragedy that accumulate into full examination; this section reads much like a cubist painting. Adding to the depth of these poems is the sections tone. While the poems are emotionally moving, they are objective investigations into specific points on a timeline. Part II investigates the importance of context. The poems examine the relationship between art and observer, storyteller and listener, religious truth and religious rite. The section concludes with a villanelle titled, “Laying It on the Line.” The poem’s persona exclaims “You’re nuts. People like us don’t write books. / Your dreaming won’t put food on the table.” This bleak commentary on how language typically belongs to those who can afford also contains a rebellious irony when place in context to the other poems in the collection. Without having to say it, the author announces that even the poor are entitled to pursue their dreams—it also cautions that the greatest impediment to following a dream is the advice of loved ones. This type of poems adds a nice balance of playfulness and dramatic depth to the collection. Worlds, spirits move more fluidly. For shelter through these nights. At this point in the collection, it is no longer possible to think in terms of a singular voice—the poems are a choir f voices channeled into images. This is a lovely turn in the collection, which makes this a book deserving of multiple readings. The wisdoms found in this collection are graciously taught through imagery and the musicality of its lines. Field Theory is an engrossing book that engages the mind, heart, and spirit; it is a journey across the fields that connect us—the distances that form holistic understanding of humanity.